Royal Marines training gives everyone the opportunity to confront their limitations. In fact, it pushes recruits to the point where they have to, and then encourages them to explore those limitations and learn how to exceed them. It's a raw experience, and while some of it is very private - for example the personal battle between a trainee and the notorious Endurance Course - at other times it can be an experience that is shared with others. The intimacy of reaching personal limits together in training means that Marines are pretty honest with each other - no-one can maintain a facade for long when they are in extremis. One dark night on Dartmoor I witnessed the moment where a friend reached his own limit and contemplated resigning from the Corps - but then gathered his reserves and pushed on. His moment hitting rock bottom and bouncing back has always inspired me, and together we learned an important lesson that night - one which I think has uses far beyond Royal Marines training - that the darkest hour is just before the dawn. Exercise Crash Action was designed to be the hardest exercise yet. 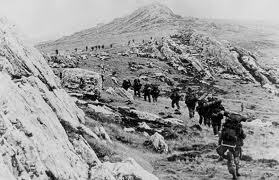 It was the first major exercise of the 4 week long Commando Course, the culmination of 9 months of arduous training. The exercise began with a yomp up onto the northern heights of Dartmoor, and lasted for a week. The formula was simple: yomp all night to prepare for a dawn attack at some distant location, then grab a few hours rest between eating, replenishing rations and ammunition and preparing for the next set of orders and planning, then start yomping again. This kind of exercise is surprisingly challenging. Unlike hillwalking, yomping is designed to maximise tactical options - so routes are chosen not for comfortable conditions underfoot or beautiful views, but for protection from observation. Each man walks alone, with at least 10m between him and the people ahead and behind so that if the line ahead is attacked those behind are free to manoeuvre to a position where they can counter-attack. We zigzagged back and forth across Dartmoor through bogs and over the notorious "babies heads" - ubiquitous tufts of tough grass that twist ankles and make walking at speed - especially with a heavy pack - arduous and uncomfortable. At one point the man in front of me collapsed into the darkness amid muffled swearing having walked into a shin-height stone forming part of an ancient stone circle. The "Troop Snake" extending over a quarter of a mile also had to cross obstacles from the roads and fences that cross the moor to the fast flowing leats and occasional bogs. And in addition to our personal equipment we were also carrying heavy communications equipment, including a Clansman 320 High Frequency (HF) radio weighing over 20lbs - an unwelcome and indivisible addition to someone's bergan. On the fourth night of the exercise at about 4.30am, we were heading south and crossed one of the few roads on the moor. As I approached a stone wall on the other side of the road, I met a friend who had stopped beside the wall before crossing it. We were moving in almost total darkness and there was no-one else nearby. He was exhausted, and faced with the prospect of continuing onto the southern part of the moor for yet more yomping, he told me quietly that he had had enough and was going to resign. I knelt down beside him and pointed out that he would regret the decision to stop now - and that we would all be very sorry to lose him because he was a very capable guy. We knelt in silence for a few moments in the darkness. Slowly and painfully he stood up and climbed over the wall, setting off across the moor. Shortly afterwards, on our left hand side the dawn began to rise over the moorland. We never discussed the incident afterwards. My colleague has gone on to a very successful career, and I'm very proud that I might have helped in a small way at what could have been a turning point in his life. My colleague resisted the temptation of the road and stuck to his chosen difficult path. Each step on that yomp took him one step closer to his green beret. As I watched him tramp into the darkness and began to settle into my own walking rhythm 10m behind him I reflected on how although our ordeal was overwhelming we could get along perfectly well by breaking it down into single steps and enjoying every glimmer of light that shone on us on the way.